2nd. Eddie Mathieson, -0.531 seconds. 3rd. Mango Darwinian, -3.044 seconds. 4th. 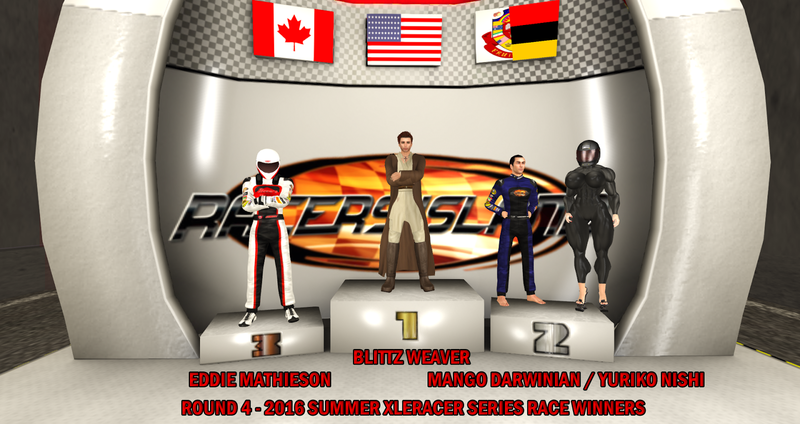 Blittz Weaver, -5.356 seconds. 5th. Dolli Dreamscape, -7.444 seconds. 6th. eddiemm Resident, -11.134 seconds. 7th. Aaron Lamont, -13.711 seconds. 8th. AdrianaZhay Resident, -15.468 seconds. 9th. Hollie Wood, -17.355 seconds. 10th. Shaft Laval, -1 laps. 2nd. Shaft Laval, -0.817 seconds. 3rd. Blittz Weaver, -3.110 seconds. 4th. Eddie Mathieson, -7.575 seconds. 5th. Mango Darwinian, -7.838 seconds. 6th. Dolli Dreamscape, -8.396 seconds. 7th. Yuriko Nishi, -8.858 seconds. 8th. eddiemm Resident, -9.621 seconds. 9th. Aaron Lamont, -11.993 seconds. 10th. AdrianaZhay Resident, -16.799 seconds. 2nd. Blittz Weaver, -5.690 seconds. 3rd. Aaron Lamont, -8.667 seconds. 4th. Hollie Wood, -9.847 seconds. 5th. Mango Darwinian, -11.157 seconds. 6th. eddiemm Resident, -12.043 seconds. 7th. Eddie Mathieson, -13.136 seconds. 8th. Dolli Dreamscape, -13.291 seconds. 9th. AdrianaZhay Resident, -14.644 seconds. 2nd. 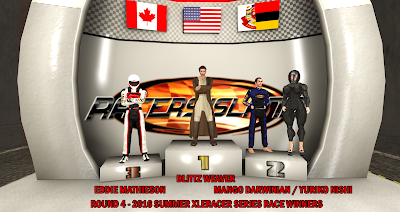 Blittz Weaver, -4.382 seconds. 3rd. Eddie Mathieson, -5.936 seconds. 4th. Dolli Dreamscape, -12.535 seconds. 5th. Yuriko Nishi, -15.317 seconds. 6th. Shaft Laval, -15.468 seconds. 7th. eddiemm Resident, -15.959 seconds. 8th. Hollie Wood, -16.563 seconds. 9th. Aaron Lamont, -16.717 seconds. 10th. AdrianaZhay Resident, -20.157 seconds.